This Excel tutorial explains how to generate random letter A to Z / a to z or a mix using RANDBETWEEN Function. In order to generate random letter, we have to make use of two Functions. In the below sections, I will briefly go going through these two Functions. For details, click on the link above. Before Excel 2007, Excel uses RAND Function to generate a random number that is greater than zero and smaller than 1. Since Excel 2007, a new Function RANDBETWEEN was added, it is used to generate a random integer between two desired integers. top The maximum integer of the random number, this number is inclusive in the random range. #Num Error will return if bottom is larger than top. 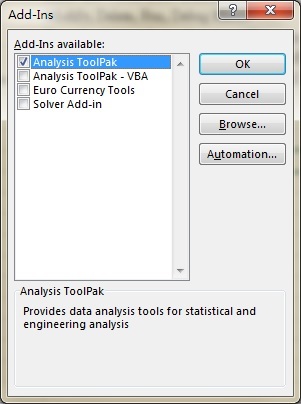 If you cannot use this function, enable Analysis TooPak under Developer tab in menu as below. Below is the ASCII value to character conversion for letter. For full conversion table, click here. To generate random letter, first decide whether you need lower case only, upper case only, or a mix of both. If you want to generate lower case only, use ASCII value 97 to 122. If you want to generate upper case only, use ASCII value 65 to 90. If you want to generate a mix of lower case and upper case, use the VBA custom Function in the following section. randType Optional. Choose whether you want to generate lower case, upper case or a mix of both.